I'm always so damn late with these reviews! Anyway. I got through this week, didn't seem especially easy. Not super hard, but certainly not easy. I had planned to run on the treadmill because I thought it was going to be hot. Then I left my phone convince me it wasn't THAT hot (it said it was 72*. Lies). So I went out on my new work run route - hilly like anything else around that area, 713 ft elevation gain. Turned out to be closer to 80* so it was a smidge miserable but I managed. I sucked down 20oz of Nuun. Done on the treadmill, nothing interesting to note. I had to run long a day early thank to the Rock 'n Roll Marathon course coming through my neighborhood and usual running route. Around mile 11 in Mission Beach, I ran in Sarah (SkinnyRunner) who I haven't seen in a really long time. We chatted for 5 minutes or so and I told her I'd look for her on the course Sunday. The last two miles of this long run were fairly brutal. It starts getting hot on the way to De Anza Cove and Crown Pointe Shores, so I was battling. And I was caked in salt at the end of it. I went through 40 ounces of Nuun. And I probably should have still taken salt tabs. I live about a half mile from the course so we went down with baby E to check out the race! We thought we missed most of the leads including the women but as it turned out, none of the super fast runners showed up. So we saw the lead females. 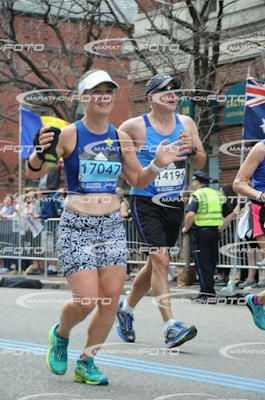 They just didn't look like your usual elite marathoner at a big city race. The winning time for the women (or even the men for that matter) wasn't all that fast. Papa and E. spectating the race! This was the #2 female. I didn't know at the time I took the pic. I had to make up for my missed easy run and I did not manage to get it done Sunday, so I squeezed it in Monday on the treadmill at work. You're coming back so strong!! I am really really struggling with acclimating to the warmer temps, plus it's been humid??? WTF, SoCal.